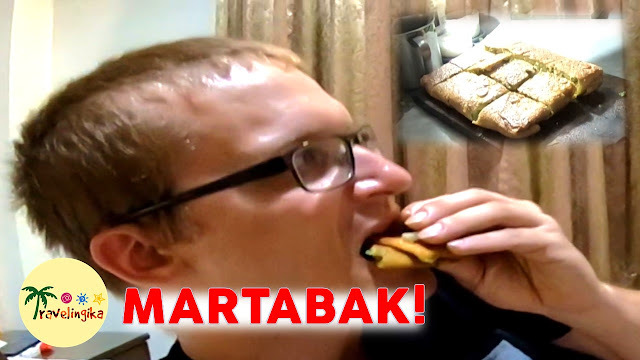 In this video, my German boyfriend was surprised on how to make Martabak. Then he tried Martabak Telor for the first time! Watch his reaction when eating Martabak Telor. The next morning, we went to my previous workplace: SMA Tritunggal Semarang (Tritunggal Senior High School) and we met some of the teachers there. MARTABAK is a stuffed pancake or pan-fried bread which is commonly found in the Arabian Peninsula and Southeast Asia, notably in Saudi Arabia, Yemen, Indonesia, Malaysia, Singapore, Brunei, and Thailand, thought it is created by Overseas Indian Muslims from Tamil Nadu, India settled in Southeast Asia and Arabian Peninsula. Depending on the location, the name and ingredients can significantly vary. The name mutabbaq (or sometimes mutabbag) in Arabic means "folded". It is a popular street food in Malaysia, Singapore, and Indonesia. Murtabak is often described as spicy folded omelette pancake with bits of vegetables. It is the most common form of murtabak; which is egg-filled pancake, sometimes mixed with green onion and minced meat, made from pan fried crepes which is folded and cut to squares. In Indonesia, the Murtabak is one of the most popular street foods and is known as "martabak". There are two Indonesian versions: a savory with egg and meat, and a sweet one. In Indonesia, the savory beaten-egg filled martabak is called martabak telur to differ it from martabak manis, the sweet martabak folded pancake.